Can I Carry Baby On My Back? It depends on what carrier you are using, your skill level, and baby's developmental age. 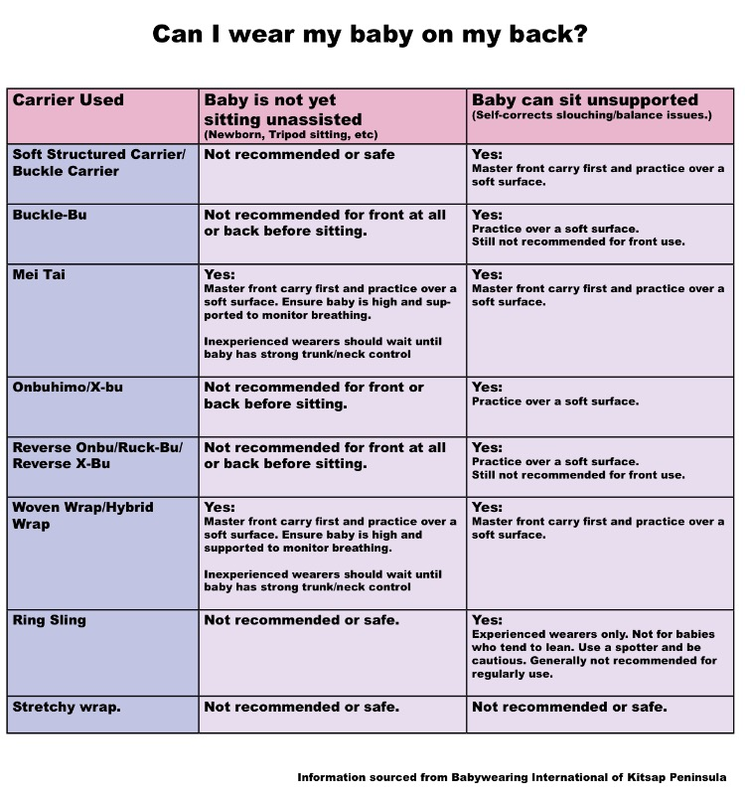 The stages here are gross oversimplifications; there are situations in which a baby might not be sitting unsupported but still be safe to carry in a soft structured carrier on your back, for example, but it is important that they have strong head, neck and trunk strength in order to prevent slumping and positional asphyxiation since they cannot be monitored as easily in a low back carrry. For commercial carriers, it is wise to always adhere to the specific brand recommendations. Soft Structured Carrier Not Recommended or safe. Yes, so long as baby fits the carrier knee-to-knee (without the legs being forced into an extended position or fabric bunched up unde their knees) in a wide ergonomic setting without any kind of infant insert or booster. Buckle Onbuhimo Not Recommended or safe. Yes, so long as baby fits the carrier arms-out and knee-to-knee. X-Onbuhimo Not Recommended or safe. Reverse X-Onbuhimo Not Recommended or safe. Master front carry first and practice over a soft surface. Keep newborns very high and supported to monitor breathing. Single-layer carriers like a Rucksack carry are often better for newborns than multi-layer carries. For first-time wearers, it is recommended to wait until baby develops some neck and trunk control - typically around 4 months old, and the wearer should have several front carries mastered. Master several front carries first and practice over a soft surface. Not very lean-proof or leg-straightener-proof, so better for short bursts with older, trustworthy toddlers. Keep newborns very high and supported to monitor breathing. For first-time wearers, it is recommended to wait until baby develops some neck and trunk control - typically around 4 months old. Stretchy Wrap Not Recommended or safe. Not Recommended or safe.